In this guide we will make vbulletin forum fixed width. First thing you need to do is login to the AdminCP of your site. Click and expand the "Styles & Templates" menu on the left. Step 1 Click "Style Manager". 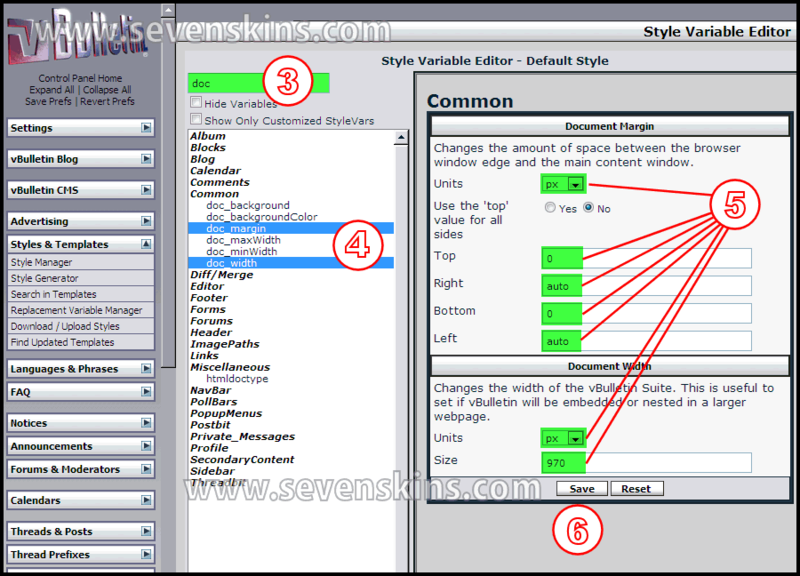 Step 2 Make sure that "Style Variable Editor" is selected and click "GO" button next to the style you want to fixed the width.This will take you to the "Style Variable Editor". Step 3 Type doc in the "Search Stylevar" field. Step 4 While holding down the "Control" key on the keyboard click and highlight "doc_margin" and "doc_width" stylevars. Step 5 Edit the values in the fields on the right as shown in the image below. Step 6 Click "Save" and you are all done.